Used to a page of search results from Smart Search, together with an optional form to allow refinement of the search criteria. Click the Menu Item Type Select button and then click the Search under Smart Search. To edit an existing Search Wrapper, click its Title in Menu Manager: Menu Items. Search Query. Enter terms to make this item return results for the predefined terms. Search Filter. Select from list of <Search filter> in drop down to limit searches to the selected filter. Note: Filters must be created using Smart Search Filters before they are populated to this drop down list. Date Filters. Show the start and end date filters in Advanced Search. Show: Show filter in Advanced Search. Hide: Hide this filter in Advanced Search. 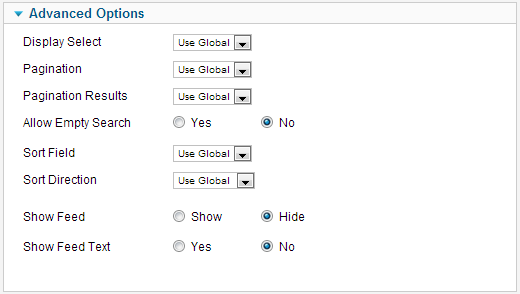 Use Global: Use the default value from the Smart Search options. Advanced Search. Users should be able to see the Advanced Search. Expand Advanced Search. Show Advanced Search in expanded state by default. Show: Show Expanded Advanced Search in results by default. Hide: Hide Expanded Advanced Search in results. Result Description. Show a description under link in search results. Show: Show description in search results. Hide: Hide description in search results. Result URL. Show the result item's URL in search results. The URL is located under the description. Show: Show URL in search results. Hide: Hide the URL in search results. Allow Empty Search. (Yes/No) Only if a filter is selected. Allows an empty search string to initiate a search with the filter constraints. Sort Field. Field to sort the search results. Sort Direction. Direction to sort search results. Show Feed. (Show/Hide) Show or Hide syndication feed link. Show Feed Text Yes, show associated feed text with feed link. No, just shows the feed title. The Smart Search layout has the following Integration Options. This page was last modified on 21 March 2013, at 15:03.